Some of the celebrations on the site of Harcourt's miniature railway project that has been named among the state's Pick My Project winners. A project engaging local teenagers to help build Australia’s biggest miniature railway at Harcourt has won a $198,000 boost, emerging as one of the state’s Pick My Project winners. The $198,000 sum will soon to be used to build a replica of the historic Maryborough railway station – complete with six platforms – as part of the wider $2.5 million project now taking shape on Victorian Miniature Railways’ scenic 65-acre site at Harcourt. 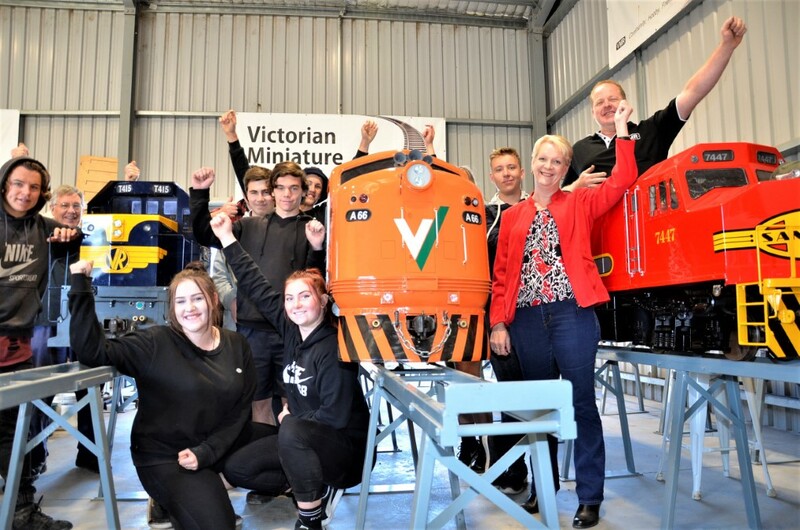 The project is a partnership between VMR and the Harcourt and District Lions Club with some 50 trades-oriented students from Castlemaine Secondary College involved in the hands-on task of developing the attraction while gaining valuable work skills. 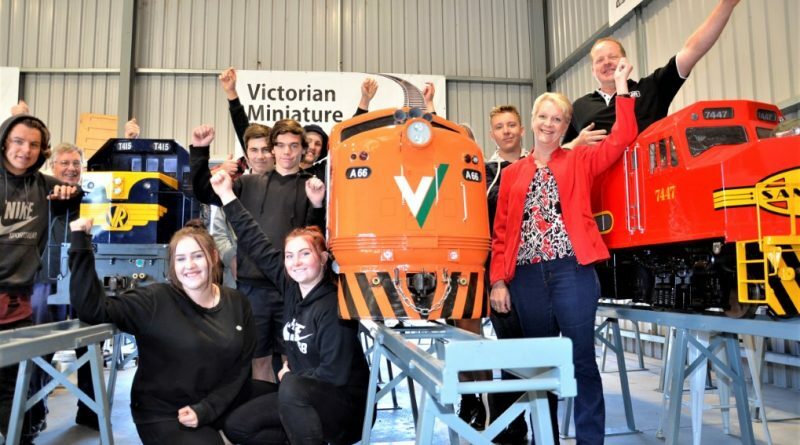 “With this injection of funds, now we can fly,” Victoria Miniature Railways club president and founder Andrew Mierisch enthused on Friday when the big win was officially announced on site by Bendigo West MP Maree Edwards. 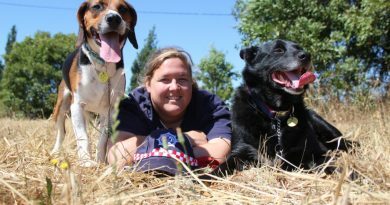 “This is going to be a boon for Harcourt and certainly a great tourist attraction for Harcourt,” Ms Edwards said. Mr Mierisch said the Pick My Project dollars would now be used to engage local tradies to build the station complex while providing the local secondary college students with practical hands-on work experience in the process. He said work to develop the station complex was expected to start early in the new year and it was hoped that the station and the first three kilometres of track would be ready to roll by mid to late next year. “We’re really hopeful it will be up and running by mid to late next year,” Mr Mierisch said. Also closely involved in the project, Harcourt and District Lions Club’s Grant Victor-Gordon said the attraction ultimately aimed to establish 25km of track and to become a major tourist drawcard. Statewide, the local project is one of 237 successful projects to share in $30 million under the state’s Pick My Project community grants initiative. 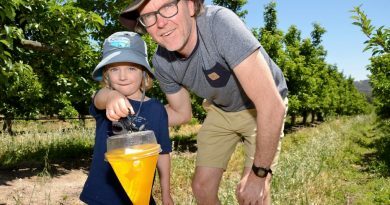 Harcourt's Terry Willis and young son, Sonny, check a male fruit fly trap in one of Harcourt's commercial apple orchards - ahead of this Saturday's fruit fly action plan launch. 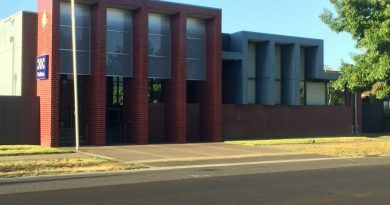 There is no current plan for Gisborne to become a 24-hour police station. Hi Geoffrey, we tweeted the story so you can retweet it from there. Hi again Geoffrey. New tasks on our website will be activated later today to allow people to share stories directly to Twitter and Facebook. Thanks for the prompt!